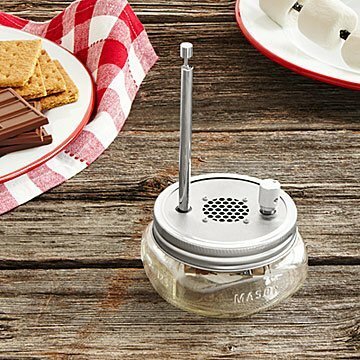 This Mason jar radio is pre-tuned to your station of choice so it's always at hand. In a world of infinite audio options, sometimes less is more. Spencer Wright and Zach Dunham seem to agree—their refreshingly minimal Mason jar radio is pre-tuned to the FM station of your choice so it's always at hand. Just turn a single knob and enjoy your favorite station without complicated controls, apps, or phone tethering. When prototyping their project, Spencer and Zach noticed listeners' loyalty to their local NPR stations and "Public Radio" resonated as an apt name for the design. The uncomplicated, cordless unit fits in anywhere at home, at work, or even outdoors. Just add two AA batteries and attach the antenna for over 30 hours of listening. If you move or change favorite station loyalty, the default station can be changed in a few simple steps. The design is compatible with any wide-mouth Mason jar, so swap in a larger one for a little bass boost. Made in Massachusetts and Brooklyn, NY. Read more about how Zach and Spencer came together to create the Public Radio on our blog. Listen to an interview from CBS Radio promoting the Public Radio here. Zach Dunham and Spencer Wright had a realization about radio: there's probably just one station you tune in to throughout the day. "While most of us are used to having unlimited options in the gadgets that surround us these days, radio is different," they observe. Whether it's the local NPR affiliate or Top 40 hits, radio listeners' interaction is a dedicated activity. The Brooklyn-based friends are both hackers, makers, and engineers. Zach's background skews towards audio, and Spencer’s tends towards mechanical stuff. They both appreciate well-designed, simple, and even single-purpose products. Keep away from water. Remove batteries for extended storage. This is a made-to-order item. If you order today your item will ship no later than 4/30/2019. I would buy this product again, and did! Neat product. Great sound, and the folks who got them as gifts loved them! This is the perfect radio for me, tuned to the only station I listen to, & it is so clear. Quirky design. Shared a pic & how much I like it with my FB friends. No worries if your power goes out! Back to basics in a complicated tech world. Great design, small footprint, two batteries, one antenna, no wifi needed or electrical outlet, awesome sound quality. I Kickstarted this project. It's a bit pricy for what it does, but I love mine. Use it to listen to NPR while I'm brushing my teeth, mostly, but I've also brought it along when moving out of the house and occasionally listened at my desk. If it were a standard radio, I'd never flip it on. Bought another as a gift for my NPR-loving in-laws, but it can go with any station. I listen to the radio two to three hours per week. EVERYONE just loves this radio. Just turn it on and there you go. Clear as a bell. You just order the station that you want it set to. I went online to find out the NPR Station closest to my area where ve vacation in Florida and when we arrived it worked beautifully. I will buy this again and again as a gift for people who like to listen to radio. Since I do not own a television, this little FM radio tuned to my NPR station, is a constant companion. It's portable, lightweight, stylish, lightweight and has an excellent sound quality. In a world utterly surrounded by screens and flashy lights, this radio is a welcome retreat to times where entertainment was nothing more than turning a dial on a radio. The Public Radio is a wonderfully simple yet elegant device. A more civilized device for a more civilized aged, one might say. Tuned to your local public radio station and that alone, all you have to do is turn one knob and adjust the volume. No apps, no crashing, no ads, no problems. The hardware is built like a tank...this feels like a solid machine, not a toy. The volume knob takes a pleasant effort to turn. The sound quality is surprisingly pleasant. I was highly impressed by the clear, crisp vocals this radio produced. Usually speakers on such small devices sound as bad as a drive-through from 1980. Function meets form in this radio like none other. If Dieter Rams listens to NPR, this would be his favorite radio to do so. Hope you enjoy it as much as I have! No I will not buy this product again.